Richard Weisman is drinking deeply from what he considers the Fountain of Youth. The 44-year-old Las Vegas car dealer injects himself with human growth hormone six times a week, in addition to swallowing a handful of dietary supplements every day. "I have young children. I do it for them," he said. "I want to be healthy as I get older." Not only that, he says, he also feels an increase in energy, muscle and libido. "My wife loves it and is going to start the program herself," said Weisman, whose luxury and sports car dealership is at Caesars Palace. 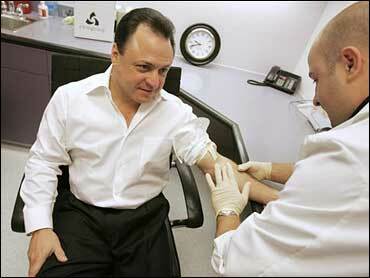 Ordinary Americans — non-athletes like Weisman — are taking human growth hormone to make themselves look and feel better. It's a practice regulators and researchers warn is illegal in many cases and dangerous, too. Human growth hormone is being offered by some doctors as part of an anti-aging regimen that can also include dietary supplements, nutrition counseling and exercise programs. Human growth hormone is produced by the pituitary gland and contributes to normal growth in children. HGH injections have been shown to increase muscle mass and reduce fat in men and women. A pharmaceutical version is approved for treating children who fail to grow, for AIDS patients who are wasting away, and for adults with a growth hormone deficiency caused, for example, by surgery or radiation. Distributing it for other uses - including turning the clock back on aging, or bulking up to hit more home runs, as sluggers such as Barry Bonds have been accused of doing - is illegal. Studies have linked HGH to diabetes, heightened blood pressure, swelling of the joints, and nerve pain. "There's no good reason, based on what we know now, to use growth hormone as an anti-aging treatment, and there is evidence of definite risks of doing it," said Dr. Evan Hadley of the National Institute on Aging. "Science doesn't have immediate answers for people who want to know what the fountain of youth is today." The Food and Drug Administration says it is investigating violations of the law and has sent warning letters to companies selling HGH over the Internet for non-approved uses. Some doctors have gotten around the restrictions by giving patients blood tests that supposedly show a human growth hormone deficiency, health experts say. These patients often go home with a prescription for HGH and a $500 monthly hormone bill that insurance does not cover. U.S. sales of HGH in 2004 totaled $622 million for legitimate and non-legitimate uses, and 74 percent of prescriptions for HGH that year went to people 20 and older, according to industry figures cited last year in a study in the Journal of the American Medical Association. "In my opinion, that suggests a large amount of illegal distribution," said Dr. Thomas Perls of Boston Medical Center, a co-author of the study. Weisman said he pays $1,000 a month for supplements and hormones, and a twice-yearly blood test costs him $650 each time. He also paid $2,000 for an initial evaluation from Cenegenics Medical Institute in Las Vegas, the clinic that designed his program and has been featured in GQ magazine. Weisman said his doctors informed him about possible side effects, but he has never experienced them. Dr. Geoffrey Jones of Oak Brook, Ill., said he puts about 15 percent of his patients on human growth hormone and defended the safety and effectiveness of HGH. "We start to see the reversal of things that are known to be growth hormone-dependent, muscle wasting and things like that. If you see the reversal of those things, you have a pretty good clinical index it was the right decision," he said. "If you don't, it's easy enough to stop" treatment.